It was 10 years ago that Chicagoans and Chicago Bears fans across the country were stunned when the franchise acquired Pro-Bowl quarterback Jay Cutler via trade from the Denver Broncos. The massive trade that involved multiple first round picks and another starting quarterback, took the NFL by surprise because the Bears had never made such a bold move. What was supposed to be years of offensive success and possible Super Bowl runs turned into frustration and debate. Never in franchise history had the Chicago Bears have a quarterback with superior arm strength and athleticism that Cutler had. He had the accuracy to fit a ball into any tight window while also being able to rocket a ball 50 yards downfield. Chicago’s quarterback also had a strong ability to scramble and make plays out for nothing also. When the Bears acquired Cutler, they were coming off a 9-7 season in which they had just missed making the playoffs. 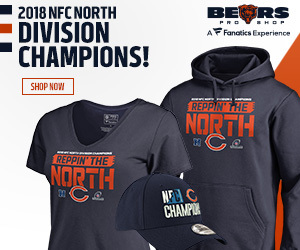 With the addition of the 25-year-old Pro-Bowl quarterback and defense two years removed from the Super Bowl, many Bears fans believed the team had a chance win multiple championships with the new quarterback. The 2009 season opener in Green Bay on Sunday Night was a foreshadowing of Cutler’s career with the Bears. Many expected the game to be a coming out party, but it turned into a huge disappointment. He was intercepted four times and sacked twice as he was consistently pressured by the Packers defense. Cutler did impress as he completed multiple deep passes of 35 yards or longer including a 63-yard bomb to receiver Johnny Knox and a 36-yard touchdown strike to Devin Hester. For as bad as he played, the Bears still led 15-13 with less than three minutes to go before Aaron Rodgers won the game with a 51-yard touchdown pass. The season opener would define the 2009 season as the offense struggled at times as Cutler was consistently intercepted and sacked. He would finish with 27 touchdown passes but led the league with 26 interceptions with a good amount being red-zone interceptions. On defense, the team was no better as they played the entire season without Hall of Fame linebacker Brian Urlacher. They had 11 games in which they allowed 21 points or more and four games of 31 points or more. At season’s end, the entire Bears offensive coaching staff including Ron Turner and Pep Hamilton were fired, with head coach Lovie Smith avoided nearly being fired also. Fans and the media believed that too much was asked from Cutler as he had an insufficient offensive line to protect him and a talent-lacking set of wide receivers. As the years went on, the team struggled to build around the quarterback they had mortgaged the future for. From 2009 to 2012, the most seasoned wide receiver Cutler had was Roy Williams while the offense lacked consistency having three offensive coordinators in four seasons. Following the trade of tight end Greg Olsen, the passing game’s most consistent weapon was running back Matt Forte. With the firing of general manager Jerry Angelo following the 2011 season, New general manager Phil Emery made a concerted effort to build around Jay. He started by acquiring Pro-Bowl Wide receiver Brandon Marshall who had strong chemistry with Cutler during their time in Denver. In the 2012 draft, future Pro-Bowl receiver Alshon Jeffery was drafted with All-Pro guard Kyle long being drafted the following year. Following the firing of Smith at the end of 2012 season, Emery hired the offensive-minded Marc Trestman as head coach to get the best out of Cutler. These are the wide receivers Jerry Angelo drafted over 10 years as #Bears GM. Jay Cutler had no chance. In 2013, the Bears would have the second-best offense in the league behind Peyton Manning’s record-setting Denver Broncos offense. Cutler, who started in just 11 games, passed for 2621 yards with 19 touchdowns to 12 interceptions. In the team’s season finale against the Packers with the division title on the line, He led the Bears to an eight-point lead in the fourth quarter before the defense lost the game on last-minute Hail Mary touchdown pass by Rodgers. The 2014 season was expected to a Super Bowl contending season as Cutler signed a contract extension making him the highest paid quarterback in the league. In the second year in Trestman’s offense and a revamped defense, the Bears were expected to make a deep playoff run, especially after a come from behind victory against the San Francisco 49ers in week two. Down 14 points, Cutler passed for four touchdowns in a 28-21 win over the reigning NFC Champions and league-best defense on the road. It would be the lone highlight of the 2014 season as the Bears finished 5-11 in what is considered one of the worst seasons in franchise history given the expectations. Trestman and Emery were fired immediately following the season. Although passing for a career-high in passing touchdowns with 28, Cutler did lead the league again in turnovers and was nearly traded by current general manager Ryan Pace in the 2015 off-season. Oddly enough, although the organization began trying to move on from Cutler, he actually had his best season with the team. He would post the best quarterback rating of his career with 92.8 rating and would win first and last game at Lambeau Field. Cutler’s superb season was even more impressive as the majority of his receivers were injured forcing him to may with inexperienced receivers in a first-year offensive system. Cutler’s Bears career would finally come to an end in 2016 as he started just five games as was placed on injured reserve following a torn labrum in week 11. It is fitting that the last pass of Cutler’s final game as Bear ended the same way as his first game did with a last-minute interception with his team down six. During his tenure, and still even now, Bears fans are still divided when looking at Cutler’s career in Chicago. Half believe that he was overrated, lacked leadership, and wasn’t durable. The other half feel that too much was expected of him, that the team could never build around him, and that he was often mischaracterized with being shown in a negative light. Both can be true a Cutler often did not have the best supporting cast of players and coaches around him and was constantly blamed for the team’s shortcomings. He did lack durability as he only started a full 16 games just once in his eight-year Bears career. Cutler’s demeanor could have been better as he was caught several times on camera disrespecting coaches verbally and physically. Failing to make it to the playoffs was Cutler’s biggest issue during his Chicago tenure. He led the Bears to the playoffs in his second season which caused many to believe that it was going to be a constant. He failed to do so but made the Bears competitive in a majority of their seasons. Cutler provided the team a presence at the quarterback position that gave them the chance to win every Sunday, something that most could not say about Bears quarterbacks before.